Co-owner of Roanoke Island Outfitters and Dive Center Pam Landrum describes what it’s like to dive near Oregon Inlet, at the wreck of a 441 foot cargo ship known as Zane Grey. In addition to a diving spot, the Zane Grey attracts recreational fisherman. These wrecks and the reefs that grow on them are important economically and ecologically. Beyond recreational diving and fishing opportunities, waters of our coast host a biologically diverse ecosystem essential to many organisms for spawning, breeding and feeding. The North Carolina Division of Marine Fisheries realized the importance of sustaining these ecosystems in the 1970’s when they started the Artificial Reef Program. Today, there are over 60 artificial reefs stretching along the entire coast, in the ocean and in estuarine waters. Artificial Reef Coordinator Jason Peters says these systems are made from recycled oyster shells, sunken ships, train box cars, reef balls and demolition waste. The goal of the State’s artificial reef program is, first, to bolster fish populations and make North Carolina attractive to anglers and divers. The artificial reef program aims to build new reef systems and enhance existing ones. 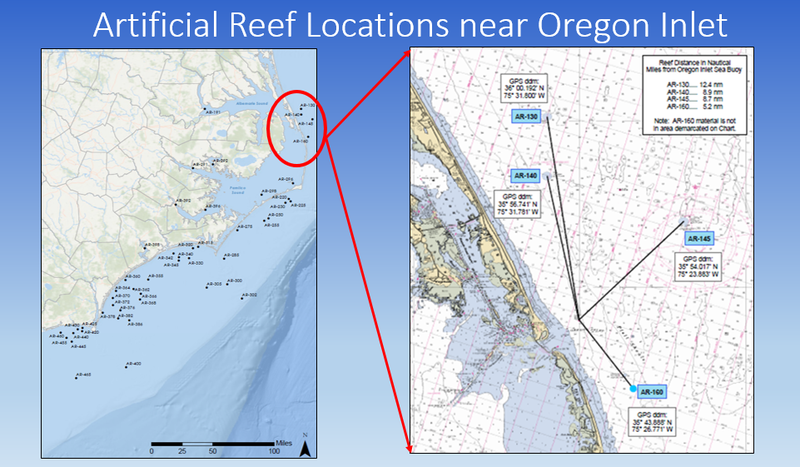 Just last week, the Division of Marine Fisheries along with the Department of Transportation announced plans to improve four artificial reefs near Oregon Inlet. When DOT finishes the Bonner Bridge replacement span, they’ll demolish the old bridge and transport about 45 thousand tons of concrete material to the reef sites. Peters makes it sound easy, but it’s a complicated process that will take about 10 months. Not only does the material give fish a place to breed and hide, it will dramatically cut down on the costs of discarding demolition debris, which would otherwise end up in a landfill. This project is already several years in the making. Peters says there have been considerable environmental and safety concerns to address. For instance, before the bridge pieces are placed on barges, they must undergo rigorous testing. 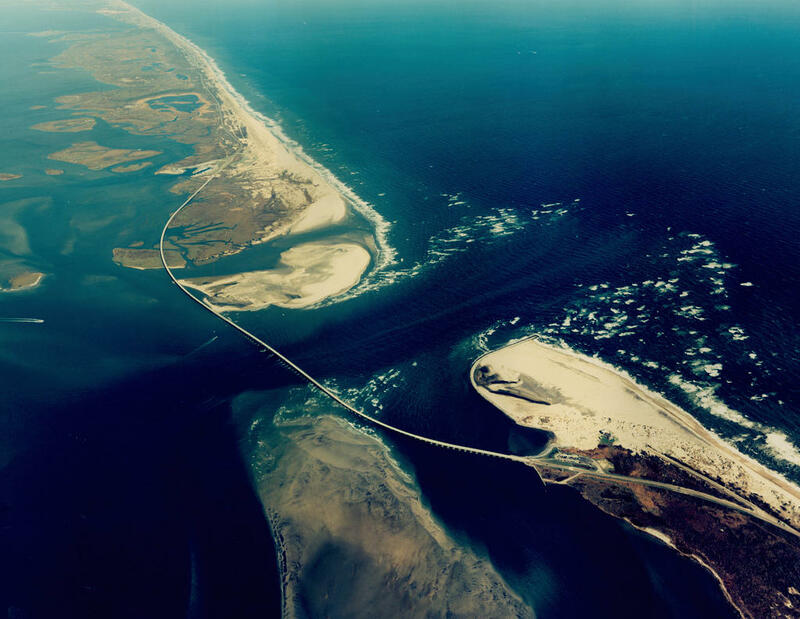 Then there’s the transportation of the bridge pieces to the sites through Oregon Inlet, which has a reputation for being difficult to navigate. Another part of the planning process involves placing materials at the site in such a way boats don’t hit it once it’s in the water. The depth at sites range from 40 to 60 feet deep. When offloading concrete from the barge, workers will have to maintain the minimum vertical clearance requirements as required by the Coast Guard. The material will be placed at four existing artificial reefs, including the Oregon Inlet Reef, the location of the Zane Grey wreck. All of these are already established reefs, some with a longer history than others. So when the new bridge pieces are finally in the water, it shouldn’t take long for fish to move in. Peters says it will be an “oasis” for transient fish. Establishing a biological community takes a little longer. But it could take years before the reefs become well-established and thriving ecosystems. Take artificial reef 145 for example. It’s located about nine nautical miles from Oregon Inlet. It’s the final resting place of the 185 foot vessel “Advance II”, a 115 foot landing craft, and two Coast Guard aircraft. Diver Pam Landrum recalls diving at the site last year. AR-145 and all of the artificial reefs near Oregon Inlet are about the same size. Each site is circular in nature with a diameter of a half nautical mile. 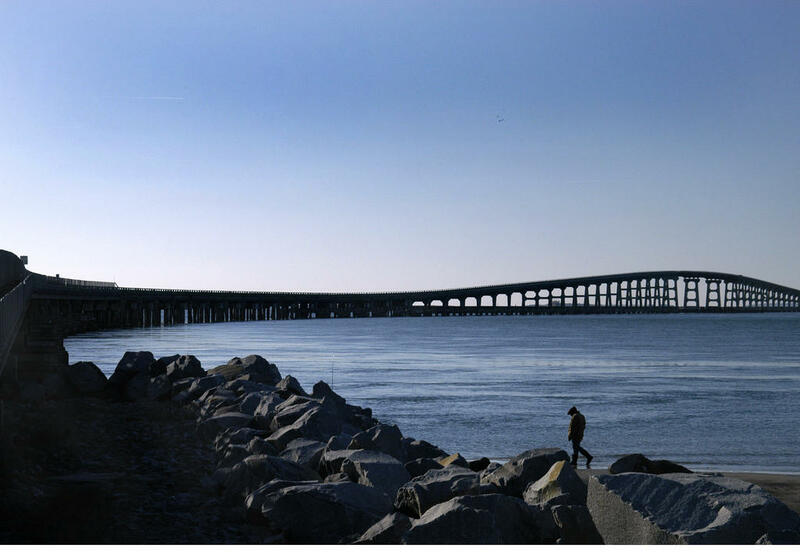 As for a timeline on the Bonner Bridge reef enhancements, construction to the replacement span is slated to start this March and take about 30 months to complete. When it’s finished, the Bonner Bridge will be demolished and the material will be placed at the proposed reef sites. Artificial Reef Coordinator Peters says that could begin as early as Fall of 2018. The next step in the process is a public hearing on the proposal. The meeting will take place February 8th at 6pm at the Dare County Administrative Building. Peters says they are hoping to hear feedback as to which sites need the most enhancement. Diver Pam Landrum says she’s excited about the project. It’s not the first time bridge pieces have been used to build a reef. In 2012, NCDOT donated 8,000 tons of material from the old Buddy Phillips Bridge to construct a 31-acre reef in the New River, between Jacksonville and Sneads Ferry. If DOT had put the material into a landfill, it would have cost $75 a dump truck load, or $590,000.